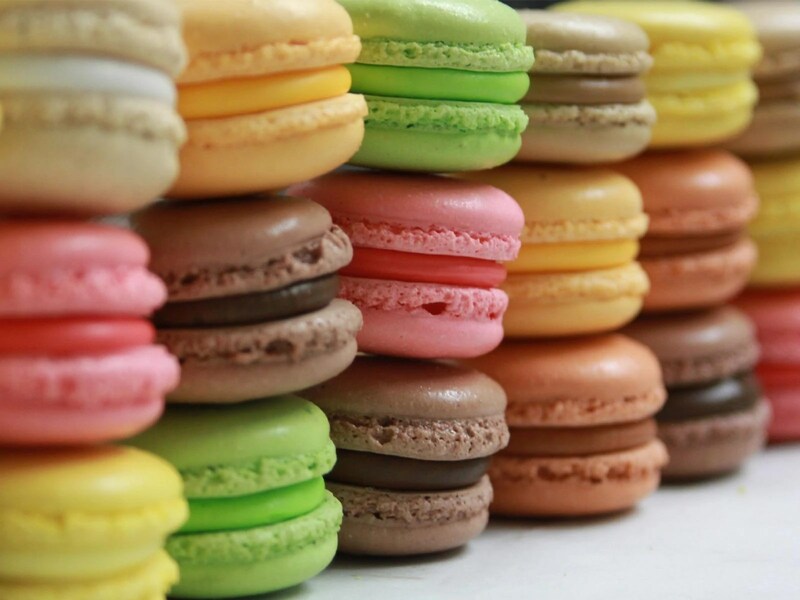 So many macarons, so little time. I welcomed Thursday March 20th not only because it was the first day of Spring but also because it was the return of Macaron Day. Macaron Day NYC began in 2010, organized by François Payard, the chef and owner of FP Patisserie and François Payard Bakery. Inspired by Jour du Macaron in Paris, Macaron Day is devoted entirely to the celebration of the French delicacy – les macarons – and many participating bakeries/patisseries donate a portion of the day’s profits to City Harvest charity. If you want to learn more about what a macaron is (and how it differs from a macaroon) as well as how to make them, watch the video on the Macaron Day website. Why was I so excited? The key part of Macaron Day is that participating locations give out a free macaron to customers! Having missed Macaron Day my first year in NYC (not by choice or accident), I was determined to make the most of my day this year. I planned my macaron excursion around the city by looking at the map of participating locations on the website and decided to work my way downtown. I knew that most locations had a limited amount so I had to hit the streets bright and early, keen and ready for my macaron reviewing and eating. If you missed Macaron Day this year, keep an eye out for it in March next year but, no matter the time of year, it is always worth knowing where to find the best macarons in the city. Here is my Macaron Day story with the places that I visited and a short review on each one. I decided to start on the UWS and took the bus down Broadway to Épicerie Boulud (1900 Broadway, between 63rd and 64th). I chose a chocolate macaron (out of a choice of three flavors) which was wrapped in cellophane – not the best idea as it was nearly impossible to uncover the macaron without crushing the soft shell. The macaron was a nice start to my day but certainly wasn’t going to steal the show. The chocolate flavor was not strong enough and the ‘biscuit’ shell exterior was slightly too soft. I walked down to Columbus Circle and stopped at Bouchon Bakery (10 Columbus Circle, floor 3) where I was given a chocolate macaron (no other choices). This macaron was slightly larger than my previous one and unwrapped. The outside shell was too chewy but the ganache was smooth (slightly too gooey, however) and the chocolate had a richer flavor although there were strong hints of hazelnut. The best macarons in the New York are at FPB. Next stop was FPB (1775 Broadway at 58th Street) and I was excited to try the macarons of the founder of Macaron Day. I was not disappointed. The vanilla macaron I chose (FPB had at least five choices) was exquisite – the strong vanilla flavor was delectable and flecks of vanilla bean graced the smooth ganache. The exterior shells were perfectly crisped but not crunchy and melted softly away on my tongue. I walked across Central Park South next to try FP Patisserie in the Plaza Food Hall. FP Patisserie had the same choices as FPB and this time I chose the chocolate and cacao nib macaron. Again, this macaron was delicious with crispy shells which softly broke as I bit into them. This macaron was by far the best chocolate macaron of the morning – the flavor was wonderfully rich and intense. Next stop was Macaron Café (625 Madison Avenue but entrance on 59th street). I had to wait in a short line here but was given a list to study while I waited, of all the macarons they sold – all of which were available for macaron day. I decided to try an unconventional crème brûlée macaron which was certainly interesting although it had a rather strange crème brûlée taste and was too sweet for my liking. I was disappointed with this macaron’s texture as the shells were very chewy – they almost tasted stale – and were extremely dense. The ganache was lovely and smooth albeit slightly too creamy. I give Macaron Café points for letting customers choose from all of their normal selection, however. Afterwards, I stopped at Mad Mac Macaron at Bernardaud (499 Park Avenue at 59th street) which was a slightly surreal experience as I walked past china displays to the back of the store to claim my free macaron. I wasn’t expecting much of the macaron, given the settings in which it was procured, but I was pleasantly surprised! I chose a blueberry macaron which had an excellent, authentic flavor complemented by the softly crisping shells and the smooth filling. My only complaint was that the macaron was smaller than all the others. I hopped on the subway to 8th Street-NYU and proceeded to walk along St Marks Place. I stopped in at Spot Dessert Bar only to find that they had run out of their designated 500 free macarons for the day (this was at about 1PM!) I continued to walk along the street to Macaron Parlour (111 St Marks Place). Here I tried the S’mores macaron and, as the world’s biggest marshmallow fan, I was impressed. The marshmallow and chocolate filling was not overly sweet and the ganache was smooth and flavorful. Normally s’mores-based treats are overly chocolate-y but this macaron had a strong marshmallow flavor which I liked. The shells were slightly too chewy and this macaron was quite small but overall I thought it was tasty and worth the far walk eastwards. I retraced my steps and continued westwards to Mille-Feuille Bakery (552 LaGuardia Place) where I was handed a salted caramel macaron. This macaron was good but not particularly noteworthy – the shells were reasonably crispy although slightly chewy and the ganache erred towards gooey rather than smooth. The salted caramel flavor was sweet and strong although the salted caramel macaron that I picked up afterwards at an FPB outshone the Mille-Feuille one. My last macaron at FPB (116 West Houston street, between MacDougal street and Thompson street) was as good as the other François Payard macarons from the morning. The salted caramel flavor was intense and again, the macaron had the perfect texture on both the outside and inside. Macaron Day 2014 was a thoroughly satisfying day and a highlight of my spring break. Look out for it next year but be sure to visit these locations throughout the year for delectable and intriguing macarons! Zoe Baker-Peng is a sophomore at Barnard and Managing Editor for The Nine Ways of Knowing. Images courtesy of Recipes wikia and FPBNYC. We feel you Mr. Snowman. Sad that the joy and freedom of winter break is over? Can’t take the dreary and cold conditions of New York in the middle of January? We get it. For your mental well being it’s important to find some excitement and happiness during these winter months. That’s why we’ve created these ideas for how to beat the notorious winter blues. Find ways to enjoy the season! Yes it’s cold out, but that means it’s the perfect time to go ice skating and enjoy some hot chocolate while strolling through Central Park! Since the holiday season is over, the tourist crowds have died down which means little to no lines at ice skating destinations. Snow day? Grab some friends, head to Riverside or Central Park, and enjoy the beautiful scenery (or have a snowball fight). Go outside! It’s tempting to just bundle up and stay inside your room, but going outside and getting some sun exposure will help with your mood, health, and outlook during colder months. Going for a walk or jog is a great way to get both exercise and some sun; at the very least, don’t take the tunnels to every class. Exercise! This seems to be the answer for everything, but it’s true. Raising your heart rate will boost your mood and can help blast away your winter blues. If it’s too cold outside, try Dodge or the Barnard track (above the basketball court in LeFrak). Exercise will not only help improve your mood, it’s also a way to stay sane, a great study break, and a way to help your body stay healthy. Buy a plant or flowers. This sounds odd, but it works! Having something that grows in your room is a great way to connect to nature, which is hard to do in the city. Buying some flowers every once in a while is a nice way to brighten up your room, which can elevate the way you feel. Reorganize your desk and closet. Get an early start on your spring-cleaning and re-arrange, organize, and clean your room. It will give you a fresh start to the semester and will improve the way you see your space (what little you have of it). Having a clean area to do work will help you focus and can minimize distractions. Having a neat closet will allow you to see what you actually have and you’ll get better use out of your clothing. Head to a museum! Since it’s so cold outside, it’s the perfect time to take advantage of the indoor wonders of NYC. Take a study break and head to a museum or gallery you’ve been wanting to visit. Plan your spring break. Need something to look forward to in order to get out of your winter funk? Plan some fun activities for spring break (March 15 to 23) and start a countdown on your calendar. It’ll keep you staying positive during these cold months. Image courtesy of Paul the Counsellor. There’s actually a lot to look forward to this semester. Unfortunately, all good things must come to an end. After a month at home, you’re either dying to get back to campus or in denial that you have to leave home, or probably a little of both. No matter how you’re feeling, it’s always challenging to readjust to a new semester back at Barnard. If you’re like me, spring semester is the better half of the year. I seem to enjoy my classes more, the grades appear to be better (though I have no scientific data to back this up), and I always feel like I’m having more fun. If you’re experiencing those first-day jitters all over again, here’s why you should be looking forward to coming back to Barnard. It’s called spring semester for a reason. While there’s no doubt New York is wonderful year round, there’s just something about campus in the warm weather that makes everything better. The magnolia tree blooms, you can sunbathe on Low steps, and the sky is usually a beautiful shade of Columbia blue. So while you may be swamped with end of semester projects, papers, and exams, at least the weather will be nice. Speaking of spring, don’t forget that Spring Break 2014 kicks off March 15. Whether you plan on recreating a certain movie or are heading home to binge watch TV in your pajamas, it’s a break we all need after the stress of midterms and surviving a frigid New York winter. And unlike fall semester’s two mini-breaks in November, Spring Break is one long week in which to party up/veg out. We deserve it. The holiday season may be over, but there’s plenty to celebrate in the upcoming months. Sure there’s no costumes and turkey, but bring on the half-price chocolate, Shamrock shakes, and pranks to pull on your gullible friends. Valentine’s Day, St. Patrick’s Day, and April Fool’s Day are the perfect excuses to make bad decisions, because this is college. The holidays of Easter, Passover, and Purim are also chances to enjoy seasonal treats and spend time with friends and family. Bacchanal – that sh*t cray. In the same vein, some of our most popular and beloved campus traditions happen during spring semester. On a sacred Saturday in April, students on both sides of campus cut loose during Holi and Bacchanal. The former involves students throwing paint at one another to celebrate the Hindu tradition to welcome the spring. The latter involves a concert on Low Plaza to commemorate all the good things in life: the end of the year, the warm weather, and the libations of Bacchus. Last year the headliners were Macklemore and Ryan Lewis, and the annual campus-wide drama of finding performers is almost as entertaining as the concert itself. Also save a meal swipe for the surf and turf dinner later in the month at John Jay and Ferris Booth, because lobster tails, that’s why. At Barnard, Spirit Day in late April involves the traditional barbeque on Lehman Lawn, collectible I ❤ BC t-shirts, and speakers pumping out the necessary 90s hits/One Direction favorites. Last year there was also a gigantic blow up slide, and you know you loved it. At some point in the near future Res Life will start sending emails about room selection, and we’ll constantly stress over lottery numbers, groups, and the fact that there’s nine groups of six ahead of us and only nine more six-person suites. Though it’s rarely exciting and more often draconian, room selection taps into our inner Grace Adler, dreaming of real estate and interior design. We’re halfway through the year, which means summer and all its joys are almost here. As bittersweet as it is, we’ll say goodbye to the Class of 2014, and they’ll begin their journey in the Real World. We’ll find out which inspiring woman (or president) has the honor of addressing them at Commencement and secretly love the inevitable controversy (see Obama, Lena Dunham) because it proves just how relevant we are. Beyond the gates, we’ll look forward to pop cultural milestones. While some of us care about football, the rest of us will pretend to for one night during the Super Bowl or just watch for the commercials. It’s even more exciting this year because it’s the first outdoor, cold weather Super Bowl at MetLife Stadium in East Rutherford, New Jersey (home state shout-out!) where the Giants and Jets play. A few weeks later we’ll attend dorm parties to watch the Academy Awards as we pretend that JLaw is our bestie while we wait with baited breath to see if Leo finally wins an Oscar. As you settle into the new semester, stressed about new classes and long syllabi, look forward to this new beginning. Once the first-week craziness starts to subside, you’ll realize all the wonderful things you have to look forward to this semester. 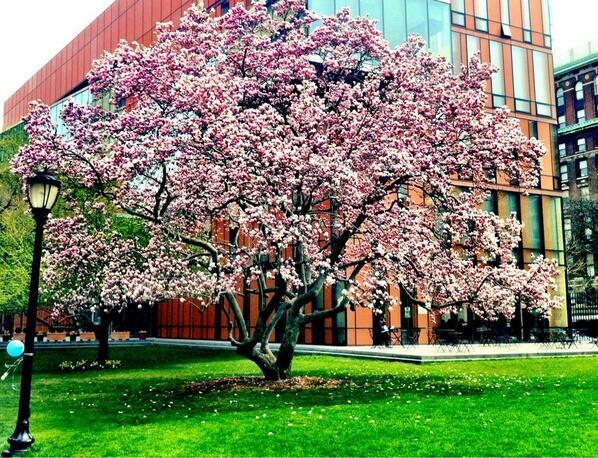 Happy Spring 2014! Images courtesy of Her Campus and Southpole.